Growing up I loved Bruce Lee. His fighting skills, elegance and wit were unique. But beyond that, he showed that someone who looked different from the conventional superstar could become a global icon (a bit like Muhammad Ali). I wasn’t alone in thinking that. In a strange mash-up, the American rap scene took him up as an icon most notably with the American hip hop group Wu-Tang Clan. Their debut album, “Enter the Wu-Tang (36 Chambers)”, was a clear play on Bruce Lee’s most famous film “Enter the Dragon”. The album was replete with samples from Asian martial arts movies. But he actually had developed a much more refined and systematic approach to living in that way. In early 1967, Bruce Lee started to develop Jeet Kune Do (JKD) which initially was a new approach to martial arts based on his own scientific studies of combat. However in 1970 due to a back injury he was bedridden for several months and was unable to train his body. This allowed him to train his mind and he realised that JKD was more about subduing oneself than subduing one’s opponent. It then would describe JKD as “the art of the soul at peace – like moonlight mirrored in a deep lake”. It should be noted that victory, technical cunning and so on are not necessarily bad in themselves, it is the desire for them that should be avoided. The desire prevents us being in a state of emptiness, which would in turn obstruct our freedom of action. I imagine that Bruce Lee thought these six desires/diseases were the more powerful ones to overcome. The desire to win (1) can obstruct us. The desire to show off or be too smart (2 and 3) could distract us from what is needed. The desire to overawe (4) could make us lose sight of the other. The desire to play a passive role (5) makes us lose accountability and exploits the other by making us appear the victim. And the desire to get rid of disease (6) or dis-ease or discomfort whether mental or physical as I would call it creates a separation between us and the factor causing is discomfort when in reality there is no separation. Anyway, I’d thoroughly recommend learning more about the philosophy of Bruce Lee. 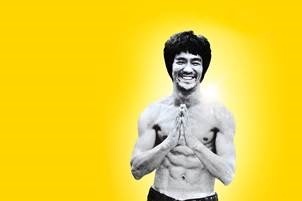 The book “Bruce Lee: Artist of Life “contains drafts of his personal writings, his daughter has a weekly podcast on his teachings and this blog contains a nice write-up of some his philosophy.